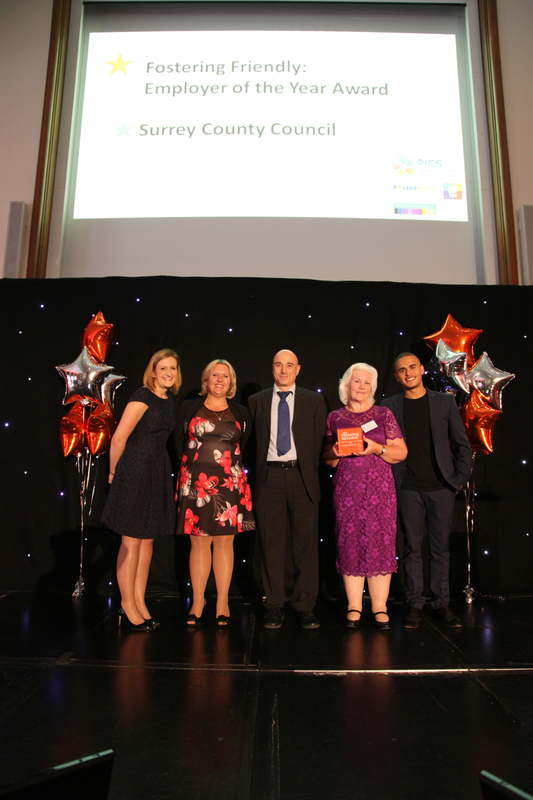 Surrey County Council has received the Fostering Friendly Employer of the Year Award at The Fostering Network’s Fostering Excellence Awards. Linda Kemeny, Surrey County Council’s Cabinet Member for Schools, Skills and Educational Achievement said: “We’re delighted to receive national recognition for the work we’ve done to support staff who give a loving home to vulnerable children. For the full media release click here and for more about Surrey County Council becoming a fostering friendly employer click here. To find out more about fostering in Surrey, visit www.surreycc.gov.uk/fostering, email fostering.recruitment@surreycc.gov.uk or call 0800 0969 626. Details of upcoming fostering recruitment events are here. Pictured from left to right: Melissa Green, Director of Operations at The Fostering Network, Cindy Morris, a Surrey foster carer, Simon Newstone, from Partnerships in Children’s Services, Linda Johnson, from Surrey County Council’s Fostering Service and Ashley John-Baptiste, BBC journalist and ambassador for The Fostering Network.